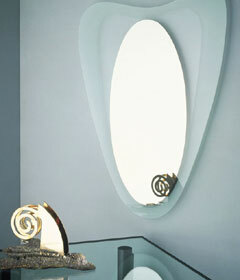 Mirrors are manufactured by applying a silver or aluminium coating to a suitable substrate. The most common substrate is clear floatglass. The reflective coating is applied to the back surface of the glass so that the reflecting side of the coating is seen on the front surface of the glass. The silver or aluminium coating itself is covered and protected by 2 layers of strong paint. We also supply aluminium mirrors in various thicknesses. Common thicknesses are 2, 3, 4, 5 and 6 mm.